Eagle-Vail’s own Chris Del Bosco finished fifth in a World Cup ski cross race in Val Thorens, France, on Friday, and first in a wind-shortened race on Thursday to give himself “a great chance of joining” the Canadian freestyle team for a shot at Olympic redemption. Eagle-Vail’s own Chris Del Bosco now has ‘a great chance’ of making Canada’s ski cross Olympic team for Sochi (Team Canada photo). John Teller, of Mammoth Lakes, Calif., won the race on Friday and clinched a spot on the Olympic team heading in the 2014 Winter Olympics in Sochi, Russia, Feb. 7-23. It was the best U.S. result of the season after Teller placed 11th in a race in Val Thorens in December. Olympic qualification is based on a points system across the different freestyle disciplines, including ski cross, and several other World Cup events are taking place in the next few days that could affect rankings before the window shuts on Jan. 19. 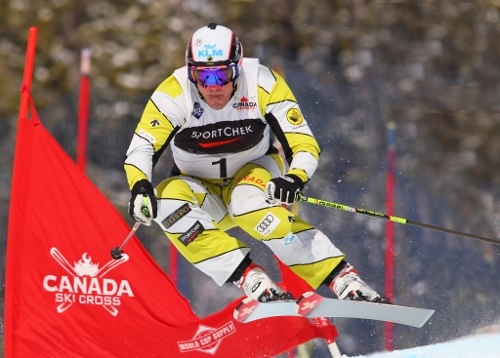 Del Bosco, who grew up in the Vail Valley but has dual citizenship because of his father and therefore races for Canada, now faces an anxious wait to learn whether he’s done enough to punch his ticket to the 2014 Winter Olympics in Sochi. Del Bosco famously finished fourth in ski cross at the 2010 Vancouver Winter Olympics when he crashed while going for gold. He went into the first of two crucial back-to-back races Thursday needing a podium to punch his ticket to the Sochi Games after a challenging start to his 2013-14 campaign. Del Bosco is the 2011 world champion in ski cross and also an X Games gold medalist in the event. Del Bosco, historically a slow starter, had only recorded a 15th-place finish in Innichen-San Candido, Italy, prior to Thursday. He was second in the test event in Sochi, Russia, last season, so in theory just needed a podium to qualify for the 2014 Games.